Fall is here--it's a dry & sunny 83 degrees. I used to think this was a pretty warm temperature but that was before I moved to Chico--honestly I'm sitting on my porch in long underwear and considering going inside for socks because my feet are quite cold. It's really very nice and fall is my favorite season here, so I wanted to do some seasonal reading. Since I a) am not very familiar with this story, and b) could get it for free at Gutenberg, I decided to go ahead and read it. If I were rating it on writing alone, it would get 5 stars easily. I loved the writing. Why don't people write like this anymore? In one of my classes this quarter, the teacher posted a chapter for us to read from a book published in 1959 and apologized for the "dated" language. It was the best thing I've read all quarter, more fun to read and easier to understand than the "untextbook" we have, with more clearly and cleverly drawn points, and none of the clunky setence structure. It was awesome. 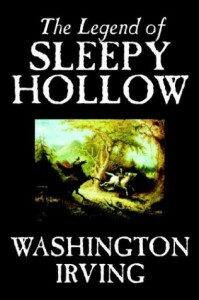 Not quite as good, though, as the writing in this book (although the messages in Sleepy Hollow are not nearly as important to me). Peter also enjoys the writing of bygone years so I read some of it outloud to him too and he was excited. But there's also the story to consider. It was pretty basic, nothing fantastic, but overall enjoyable. And then there was, you know, the sexism and racism. Women, they're completely impossible to fathom and make men unhappier than the devil himself, don'tchaknow, even though at the end of the day they're just possessions! Black people, they have nothing but admiration for the people who look down on them. Blah blah blah I know it was 1820 but there were still people back then who managed to not broadcast that noise. Anyway...I really really enjoyed the style of writing. I might read it next autumn too since it's so short, or maybe give one of his others a try.